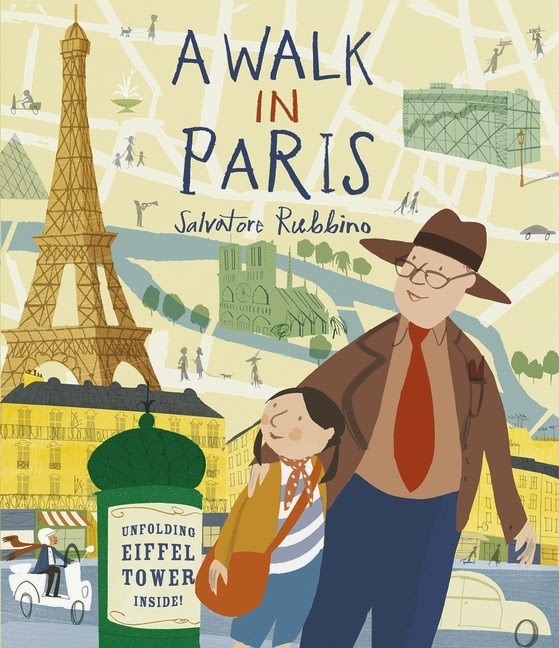 If, like me, you and your family are enjoying a stay-cation yet again this summer, you might enjoy a little armchair traveling, which is what A Walk in Paris by Salvatore Rubbino is perfect for. 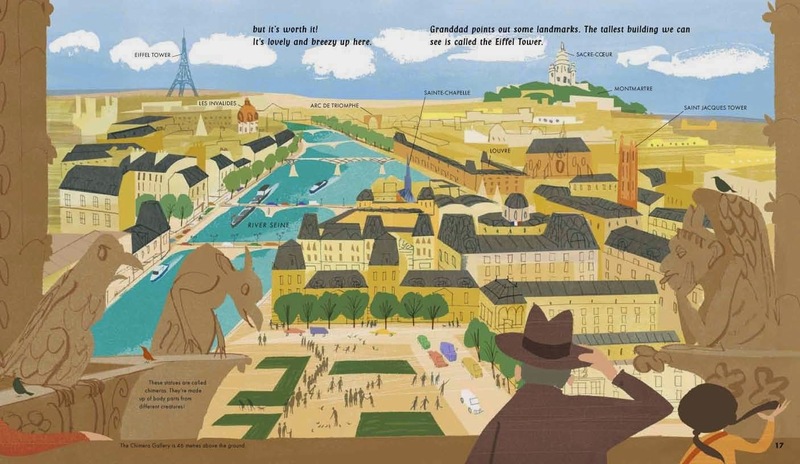 Of course, A Walk in Paris is also a superb book to read to any little listeners who just might be visiting the City of Lights themselves. 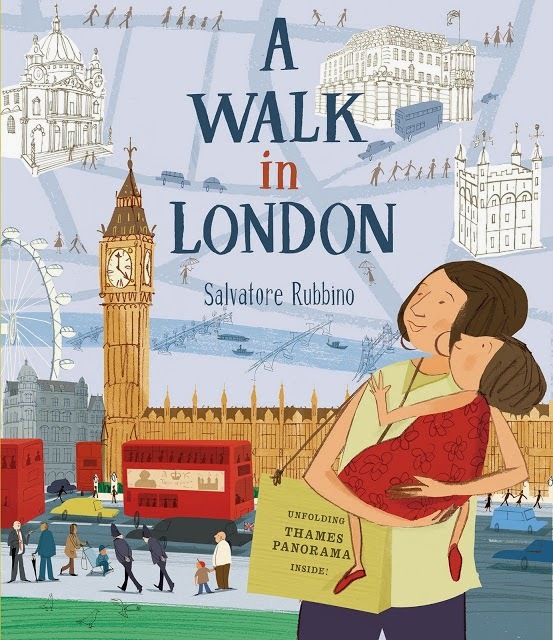 If your travels take you elsewhere, Rubbino is also happy to take you on a A Walk in London and A Walk in New York! In each book, a child and an adult explore the city. 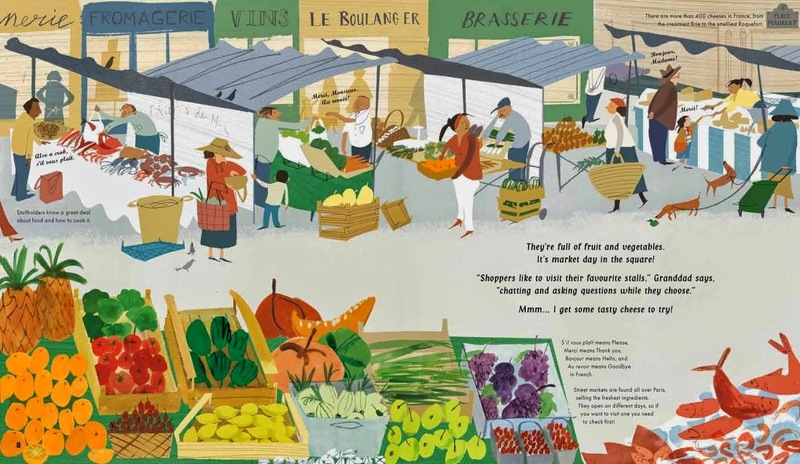 In A Walk in Paris, a young girl and her grandfather emerge from the Métro at Place Maubert, home to one of Paris's oldest street markets. 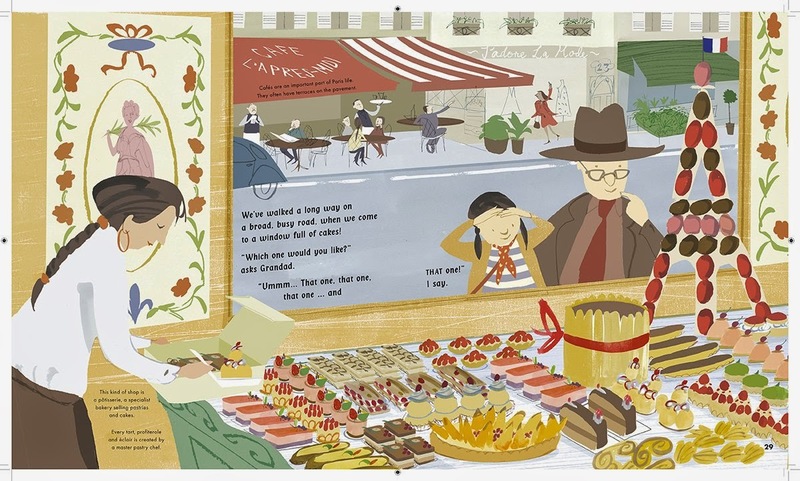 Rubbino's texts takes the pair on a meandering journey around the city while smaller, bite sized facts are scattered discretely around the illustrations on each page, giving you two ways to read this book. The girl and her grandfather see the sights, their route mapped out on on the endpapers at the front and back of the book, which includes an index of the Paris places as well as a challenge to spot all seven of the images of the Mona Lisa scattered throughout the book. Having never been to Paris I especially appreciated the smaller details Rubbino included, like the special taps in the street that send water gushing along the curb, allowing the green clad street cleaners to get the job done. I also learned about the Wallace Fountains that are scattered on busy sidewalks and in squares all over the city. These fountains are a source of clean drinking water in the summer, water that comes from one of two delivery systems in the city proving drinking and cleaning water to all Parisians. Rubbino wraps up A Walk in Paris wonderfully as the pair emerges once again from a Métro station where a surprise awaits the girl. As the sky darkens, they turn to see the Eiffel Tower lighting up the night sky on a fold-out (up, really) two-page spread! Facts about the tower, from height to weight to builder to the fact that it sways a little in strong winds and shrinks or grows up to six inches depending on the temperature, are included on the page. 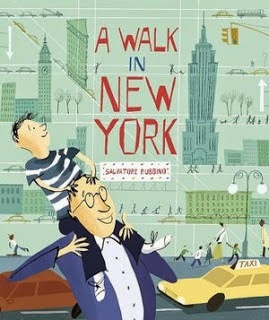 I love Rubbino's books, but I think that A Walk in Paris just might be my favorite! I hope the series continues with a walk in Rome, Prague, Istanbul, Cairo or Mexico City! I hope you have a lot of frequent flier miles, Mr. Rubbino . . . Thanks for reading and commenting! I love those old Golden Books - especially the ones (like The Kitten Who Thought He Was a Mouse) that are illustrated by Garth Williams. Did you read Richard Scarry as a kid? You have to get CARS AND TRUCKS AND THINGS THAT GO to read with your son. Be sure to look for Goldbug on every page. The Grover book was my favorite when I was a kid, too! HUGE Richard Scarry fan! Actually one of my favorite books was one he illustrated called a story a day. It had 365 stories in it. It was originally my sister's and it was handed down to me. I remember my sister reading to me from it just to get me to go to sleep. When she was pregnant with my niece a few years ago I search high and low to find a copy of the book. It took me a while to find the one from when we were kids because they had come out with other editions and had changed a few of the stories in it to make it more diverse. Which I have no problem at all with diversity but I really wanted to give her that one from our childhood. She broke down crying when she opened it at her baby shower. Was so totally worth the hours of scouring ebay for it. What a wonderful story!!! Was that the book with the lion farmer driving the tractor on the cover? I know what you mean about wanting the edition from your childhood despite positive changes. Richard Scarry's books have gone through so many changes. There is a great kid's book blog called Playing By the Book and the author did a side by side comparison of the changes in Scarry's books. I was pretty sad when I tried to replace my childhood copy of What Do People Do All Day when my daughter was born 22 years ago and finding it was edited. I'm going to have to check out that blog. Since I've just came back to blogging I've been seeking out other blogs for good suggestions on books to read. Wow! So cool! I had never seen that one. That's the other thing about Richard Scarry - his publisher keeps repackaging his in various combinations. Here's a link to the post I mentioned: http://www.playingbythebook.net/2013/10/07/playing-spot-the-difference-with-richard-scarrys-best-word-book-ever/. The blogger is based in the UK and has a great perspective. She also always includes activities and music related to the books she reviews.